GINK original English definition means; 'small salmon or smolt.' 'A good fellow', such as 'He is a GINK, means, he is a good fellow.' Today, the word's intention is to mean 'Good Fisherman' and it is the name of our main product Gehrke's GINK. Gehrke's GINK : The #1 Dry Fly Dressing Sold Worldwide. GINK original English definition means; &apos;small salmon or smolt.&apos; &apos;A good fellow&apos;, such as &apos;He is a GINK, means, he is a good fellow.&apos; Today, the word&apos;s intention is to mean &apos;Good Fisherman&apos; and it is the name of our main product Gehrke&apos;s GINK. Gehrke&apos;s GINK : The #1 Dry Fly Dressing Sold Worldwide. Gehrke&apos;s GINK When it comes to SKATING Salmon Steelhead patterns is the world&apos;s foremost Game Fish Fly Dressing. THIS YEAR: Stop thinking of Gink as just a dry fly dressing. Gink is deadly when used to skate streamers that entice Steelhead and Salmon to take chase. USE GINK WHEN STEELHEADING! Gehrke&apos;s GINK is now 28 years old . It is the first commercially offered, safe, dry fly dressing that floated flies repeatedly. Its&apos; features and functions are unique in the world of chemistry and fly fishing. Gehrke&apos;s GONK has a specific gravity of only .77% that of water, which means it&apos;s lighter than water. Gehrke&apos;s GINK is a liquid emulsifier that permeates deep into the body material of dry flies. It will either coat sythetics or penetrate fur or feather. GINK is a light paste that turns to a liquid at skin temperature. Upon coming in contact with cold water it returns to a clear, unseen, invisible gel that keeps water from making your dry flies or streaking streamers, wet. Flies stay dry for the normal useful life of any and all dry flies astream. 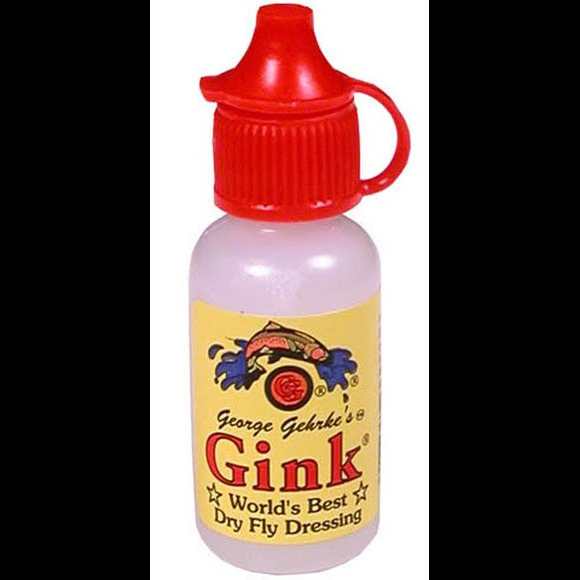 Gehrke&apos;s GINK has helped set more world records than all other dry fly dressings in the world combined. This includes total sales, making, after 27 years of service the most revolutionary product in dry fly fishing history. Gehrke&apos;s GINK was invented by Mr. George Eugene Gehrke. Gehrke&apos;s GINK is easy to use. Simply dab a little Gehrke&apos;s GINK onto a dry, dry fly (before it is allowed to get wet) and rub it into the fly until dressed. Hackles do not become matted or caked with Gehrke&apos;s GINK. A serious fault of silicone based dressings that attract dirt, grit, and which cake expensive hackles into a matted mess. Gehrke&apos;s GINK is fly friendly in all aspects. The product will even float a bare #8 light wire dry fly hook, but this is nothing more than an entertaining thing to see float in a glass of water. Simply rinse the fly after a fish is caught and false cast dry. Dress only the first two inches of tippet from dry flies with Gehrke&apos;s GINK as this is all the leader necessary to float from the fly. Gehrke&apos;s GINK has no smell or odors and leaves no oil slicks as other dressing do. Gehrke&apos;s GINK is an original invention that is environmentally safe and &apos;Fly Friendly&apos;. There is hardly a serious fly fisher that goes astream without Gehrke&apos;s GINK. GINK is a legacy that spans several Presidents. The first to use GINK was Dwight Eisenhower, and then every fly fishing President there after including Jimmy Carter and George Bush. Other well known users have been Curt Gowdy, Lee Joan Wulff, John Randolph of Flyfisherman&apos;s Magazine, George Harvey, Dan Byford of Zonker fame, and a hodge-podge of other fly fishermen that spans the entire spectrum of the fly fishing world. I can think of people such as Hollywood actors to the man next door. Gehrke&apos;s GINK has touched the lives of many and has gone fishing with men and women to all corners of this world. Wherever fish can be caught on a dry fly, you will inevitably find . . . GINK. Fully and unconditionally guaranteed, Gehrke&apos;s GINK has not let one dry Fly-fisherman down . . . ever.